The Mono Basin is an oasis for hundreds of species of birds, many of which rely exclusively on alkali flies and brine shrimp for sustenance. The lake is critical habitat for California Gulls, Eared Grebes, and phalaropes. 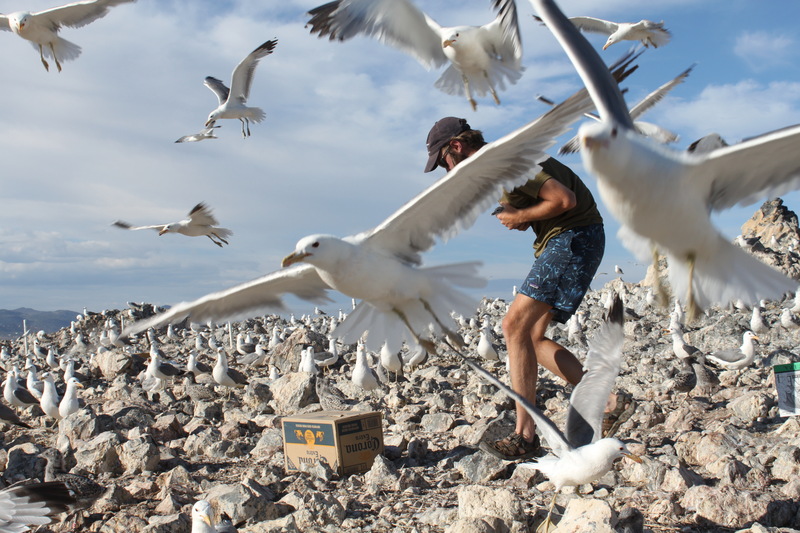 Since 1983, scientists have been studying the California Gulls at Mono Lake. Photo by Jessica Malish. 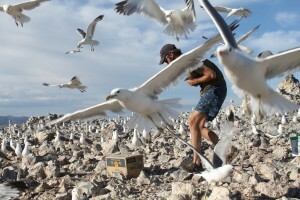 California Gull: This bird is an icon of Mono Lake. Each year, about 50,000 California Gulls nest here. In the late 1970s, however, the declining lake level exposed a landbridge between the mainland and Negit Island (the small black island on the lake that was once the gull’s primary nesting ground), allowing coyotes to prey on eggs and chicks. The rising lake level has now covered the landbridge so the gulls are able to once again safely nest on Negit and the surrounding islets. If you are here in the summer, listen for the gulls’ calls—it sounds like being at the beach in California in the winter! 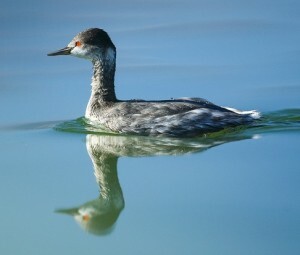 An Eared Grebe floating on Mono Lake—notice its striking red eye. Eared Grebe: Grebes are expert swimmers and divers, well adapted for life in the water. They are able to quickly scoop up brine shrimp or dive under to avoid getting picked up by a raptor. Since they are weak fliers, they migrate at night to avoid detection, but they must land on water—they cannot stand on land because their legs are positioned far back on their bodies for better swimming power. If you are here in the fall, count the number of grebes you can see from where you are—they look like small black dots. If you could count all the grebes on the lake, you would reach nearly a million! 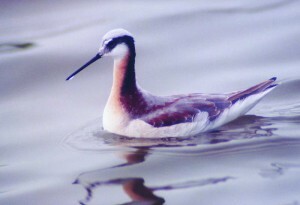 Wilson’s Phalaropes are often seen spinning on the lake, creating a whirlpool to draw up shrimp. Wilson’s and Red-Necked phalaropes: Phalaropes are small shorebirds that use Mono Lake as a critical stopover on their long migrations. 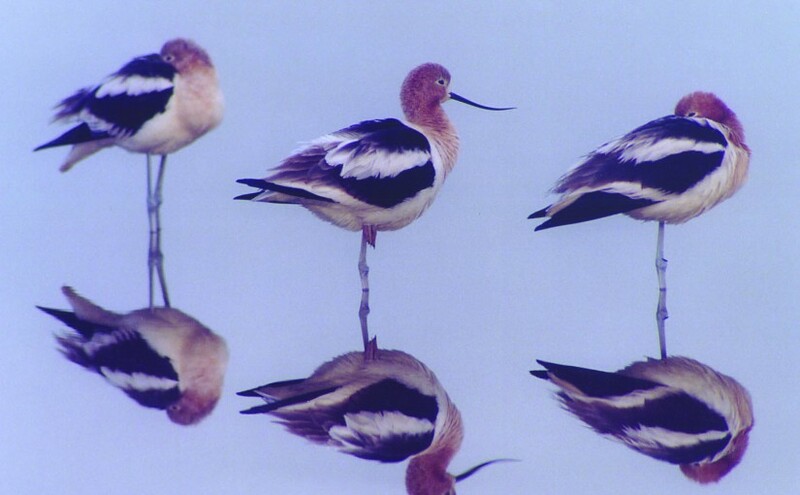 Spending summers in the northern United States and southern Canada, these birds double their body weight here by eating shrimp and flies before flying to their wintering grounds in South America. They fly nonstop for three days, covering about 3,000 miles, the Red-Necked Phalarope traveling even farther to the southern-most reaches of South America. Continue following the trail and stop after you pass the last tufa grove where the trail becomes sandy again.